Why do I Cough after Eating? 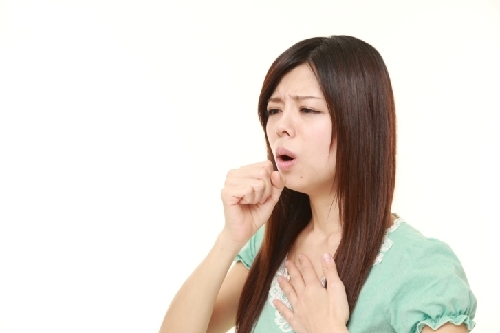 Home » General Health » What are the Causes of Coughing After Eating? Having a bit of a cough after eating isn’t necessarily a big deal, but when you develop a chronic cough after every meal, it can be very frustrating and annoying, or worse, it could be a sign of a serious health problem. Everybody coughs from time to time; coughing is our body’s way of clearing out irritating substances from the throat or airways. It could be the result of something that you’ve eaten or inhaled that irritates the throat, or maybe you drank something that triggered a reaction. In any case, coughing can occur, as an attempt by the body to remove the substance. A number of health conditions can cause a chronic cough after eating, including allergies, infections, and various gastrointestinal disorders. There are several health conditions, ranging from the minor to the more serious, which may potentially cause a cough after eating. A few of them are listed below. If you experience a cough after eating spicy food, then it’s possible that food allergies are to blame. A number of common bodily reactions may occur if you’re exposed to an allergen or an irritant, including a stuffy nose, watery eyes, and coughing. What’s really happening is that your immune system is responding after being exposed to a trigger; coughing is its way of dealing with it. Many people experience a cough after eating dairy, particularly if they are lactose intolerant. However, if you have a cough after eating ice cream, dairy isn’t always to blame—cold foods can also trigger this reaction in some people. If you have an infection in your esophagus or larynx, then you may experience coughing after eating. Infections can cause inflammation in these areas of the throat, which can cause them to malfunction, and coughing may be a symptom of the inflammation. Bacteria, viruses, and fungi can all cause infections, and they require medical treatment to be corrected. Gastroesophageal reflux disease (GERD) is also called acid reflux, and it’s a common cause of a chronic cough after eating (1). With GERD, the lower esophageal sphincter (which is a ring-shaped muscle that keeps the top of the stomach closed) does not function properly and allows partially digested food and stomach acid to rise into the esophagus. This acid causes irritation, which can lead to coughing, as well as other symptoms including heartburn. If you have GERD coughing after eating, then you may also have indigestion, malnutrition, and bloating. A persistent cough after eating may also be caused by difficulty swallowing, a condition known as dysphagia. The act of swallowing food and beverages slows and becomes harder to accomplish; sometimes it becomes impossible. It may appear that the body is rejecting the substances, with coughing and the gagging reflex that occurs during and after eating. Dysphagia may present symptoms of choking while eating, regurgitation of food through esophageal or nasal passages, excessive drooling, or the sensation of having food stuck in the middle of the throat. With asthma, coughing with eating may result from either an allergy to the food or complications of the lung disease itself. As a chronic illness, asthma can irritate the airways, causing persistent coughing when eating. Some food and drinks contain sulphites, an additive that triggers an allergy response in some people, especially asthmatics. This may cause breathing difficulty along with the common asthma symptoms of wheezing, chest tightness, and early morning or late-night coughing episodes. Unlike traditional pneumonia, which is typically caused by a viral or bacterial infection, aspiration pneumonia refers to food, drink, or saliva accidentally entering the lungs. This often occurs when eating or drinking too quickly or while vomiting. Your body will respond by triggering constant coughing to stop the unfamiliar entry into the lungs. This usually signals the lungs to prevent the particles or liquid from entering. If not stopped, bacteria may develop, and aspiration pneumonia evolves. Symptoms may include a wet cough; heartburn; excessive saliva production; or immediate fever, coughing, and congestion after eating. Many people experience acid reflux from time to time, but GERD is a chronic condition and may be of greater concern. If GERD is left untreated, it can eventually lead to more serious symptoms and health conditions. As mentioned, GERD can cause heartburn, indigestion, and malnutrition, and it can also result in wheezing, bloating, and abdominal pain, and can be linked to irritable bowel syndrome and other digestive disorders (2). Chronic coughing is one of the most common symptoms of GERD. Even if you don’t have other noticeable signs of indigestion, you may still have GERD. Without treating this acid reflux cough after eating, you could go on to develop other even worse symptoms. It’s estimated that 25% of chronic coughing cases are due to GERD, so anyone with a coughing problem needs to explore this possibility. If you experience coughing after eating and drinking, there are some steps you can take to help solve the problem. If you don’t chew your food properly, it can be harder to digest, which can lead to coughing. Eat slower and chew more. A healthy, nutritious diet is less likely to cause digestive upset. Processed foods can be more difficult to digest, plus they’re often low in fiber. Though fiber is often overlooked, it’s important to take in an adequate amount of it every day, as it will help move stool through the colon. Nutritious diets can also help boost your immune system. If your throat dries out, it can easily become irritated. Stay hydrated, by drinking lots of water, but you can also drink warm teas and other soothing beverages. If you are coughing up mucus after eating, it could be due to a dry throat. Certain foods may be triggering your cough and/or gastric upset. Eliminate common foods that cause allergic reactions, such as spicy food and dairy. As well, note when your symptoms occur and see if you can narrow down if a food is causing your cough. If your throat is dried out, you can use a humidifier or mister to breathe in warmer air and moisten your airways. There are some OTC remedies you can try to help increase digestion and reduce gastric upset, if GERD is your problem. Digestive enzymes can help increase digestion when taken with meals. You can also take other supplements which help with stomach acid problems. Coughing after eating can affect anyone. If your throat gets dry enough or if you develop a digestive disorder, then you may get a cough. If you don’t yet have a serious coughing problem but you want to take steps to prevent one from developing, there are a few things you can do. 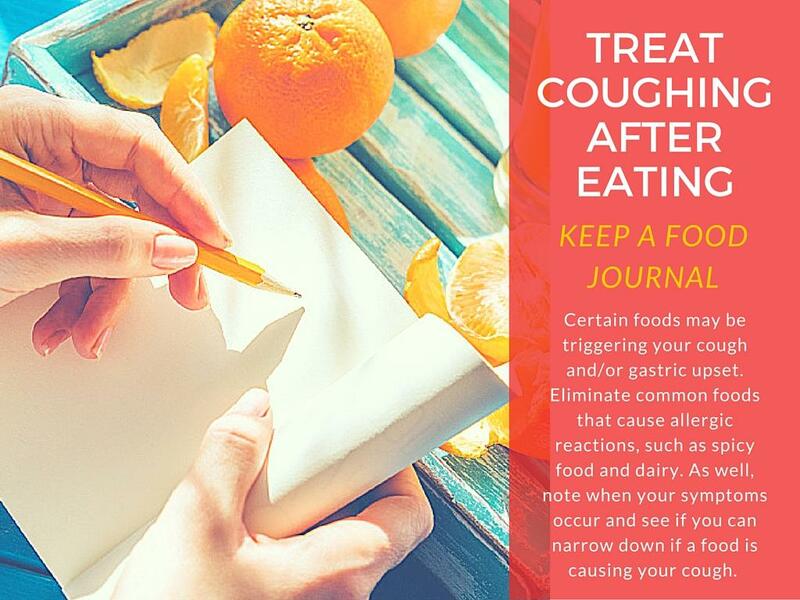 To help you identify which foods and beverages may trigger an allergic coughing response, keep a food journal. Monitor the type, amount, and any response to each food and drink consumed. Slow down and chew each bite of food. Coughing after eating is common when a meal is consumed too fast. The body needs time to digest after every bite. A helpful tip may be to put down the fork after each bite. Coughing after eating caused by food sensitives or allergies may be relieved, or prevented, by choosing healthy foods. Eat fresh fruits and vegetables while avoiding high-fat and processed foods. A healthy diet will boost your immune system to help you fight any harmful pathogens that can cause coughing after eating. A humidifier or vaporizer may help to reduce mucus and keep your throat moist to stop coughing after eating. Breathe in the hot steam, or when away from home, cup your hands over your nose and mouth and breathe deeply. Coughing after eating is commonly caused by a dry throat. Drink water and warm beverages throughout the day to hydrate your mouth and throat. Getting the proper amount of sleep is important for every aspect of health, including coughs. Sleep helps the body recover, which in turn can help it fight off irritants. Many smokers have a wet cough after eating, since smoking damages the cilia in your throat. This means that your body doesn’t remove mucus as well as it should, which can lead to a chronic coughing problem. A healthy immune system can help fight off irritants, allergens, and other things which contribute to coughing. If you have a dry cough after eating, consider taking a supplement like vitamin C to boost immune function. Your coughing is chronic and occurs after most meals. If you cough after eating, then it could just be a frustrating annoyance, or it could be a sign of a more serious health condition. There are a number of steps you can take to reduce your coughing. While some coughs are due to allergies or infections, many coughs are linked to gastrointestinal disorders, particularly GERD. Luckily, most coughs after eating can be treated using at-home remedies. So if you’re having a coughing fit after every meal, don’t worry—just take the steps to get yourself better! “What causes Coughing after Eating in adults?” Coughing After Eating, March 9, 2017; http://www.coughingaftereating.org/coughing-after-eating/, last accessed November 2, 2017. “6 Reasons You Cough After Eating,” Healthline; https://www.healthline.com/health/cough-after-eating#overview1, last accessed November 2, 2017. “Why are You Coughing after You Eat?” New Health Advisor; http://www.newhealthadvisor.com/Coughing-After-Eating.html, last accessed November 2, 2017. Entila, I., “Coughing After Eating: Causes, Treatment, and Prevention,” Daily Health Cures, August 9, 2017; https://www.dailyhealthcures.com/general-health/coughing-after-eating/, last accessed November 2, 2017. “Causes and Treatments For Coughing After Eating,” Natural Remedy Ideas; http://naturalremedyideas.com/coughing-after-eating/, last accessed November 2, 2017.